The erhu is one of the most important Chinese instruments, with a history of over 4,000 years. Though it has only two strings, it can convey a wide range of emotions. 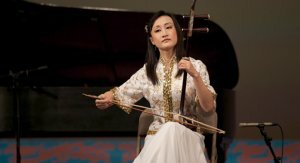 While the erhu has been called the “Chinese violin,” it differs from the western instrument in many ways. First, it is played vertically, often resting on the musician's lap. It has no fingerboard, so the player's fingers must hold and vibrate the strings by pressing only against the strings themselves. The erhu bow is already fixed between the two strings, and the bow hair is either pushed forward or backward to catch a string. The music resonates from the instrument’s wooden drum, which acts as a natural amplifier. 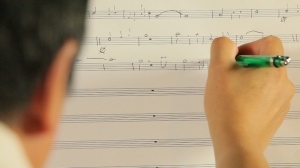 Intonation is one of the instrument’s greatest challenges, as different positions and degrees of pressure can dramatically change the free-floating strings’ pitch. The erhu is incredibly expressive, capable of imitating sounds from chirping birds to neighing horses. An alto instrument with a middle-high musical range, its melodies can be tender or sonorous. 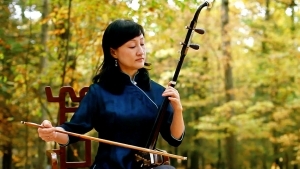 In its lowest and middle range, the erhu is especially stirring and somber, a quality eminently suitable for conveying the grand pageant of China’s history and the emotions of its people.